The wives and partners of serving Royal Marines all share a common bond. You will often find that whilst their loved ones are away on exercises or military operations, wives and partners will come together to support each other. During these informal meetings, information on what the Royal Marines have been doing is shared and any fears or concerns are allayed. The Chaplains, HIVE Centre personnel – a tri-Service information network available to all members of the Service community - and Welfare Officers will also ensure the wellbeing of partners and children are their main concern. The facilities and support offered is of the highest standard. Every effort is made to make sure those remaining at home are kept informed and as happy as possible. The sports facilities, messes and housing will all be available to wives and partners during a military deployment. These are often a good focal point for a cup of coffee or dinner evenings. 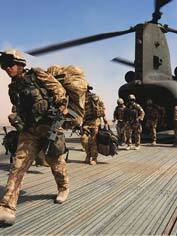 This website will give you regular updates on the movements of the Royal Marines whilst away on military operations. Service Families Accommodation is provided for married personnel. Rent is significantly lower than that for privately rented accommodation of a similar standard. For example, if you had 2 children you would pay (including Contribution In Lieu of Council Tax (CILOCT)) £305 per month for furnished accommodation. The commercial rate for a similar property in Plymouth area is upwards of £550. Depending on the age of the child this could be worth more £12,000 a year (per child) and will allow you to educate your child privately for, in some cases, as little as 10% of the fees. Grossed up for tax (at 40%), BSA (senior) is worth over £20,000 per year per child. I had been going out with Dean for about a year when he told me he was joining the Marines. I was really worried that he would be away for long periods of time and that we might not see each other as much as we would like to. Once he joined up he had to stay on camp for the first weekend. But after that he got home most weekends or I went to Devon to see him. I went down with his parents to Families’ Day at the end of week three. It was really good to meet his training team and the other lads in his troop. They all seemed really nice and really passionate about what they were doing. We had loads of talks from the Chaplain and Dean’s Commanders who reassured us he was in safe hands. During his training Dean got injured and had to spend some time getting better. He was really down during this time and it put a lot of pressure on our relationship. His mum and dad were really good though and after a few weeks he was back in training and things calmed down again. He always came home with really funny stories and told us loads of things about what he had been doing. On his Pass Out day I was really pleased he had passed training and got to meet all his friends that he had made over the several months. When he finished training he chose to go to Scotland, which was good as he was a lot closer to home. I still worry about him and what it will be like if he gets sent away. But I reckon him going through training was the hardest part and everything else will be relatively easy.